Hudson, WI—The YMCA of the Greater Twin Cities, a leading nonprofit dedicated to strengthening communities through youth development, healthy living and social responsibility, and Royal Credit Union Foundation co-host the fourth annual Prairie Burn Music Festival on Saturday, September 15. Proceeds benefit Twin Cities YMCA Camp endowments, making life changing camp experiences accessible to all for many years to come. The fourth annual Prairie Burn Music Festival at Camp St. Croix in Hudson, Wisconsin, will feature 11 live music acts, including Now, Now, jeremy messersmith, PaviElle, Wisini, and Brother Ali, as well as camping hosted by REI, food trucks and camp games and activities for all ages. All net proceeds will help ensure every kid has the chance to experience camp. “Everyone should go to camp because it teaches you to show respect to everyone, even if you’re different from them,” said eight-year old Damien from the Boys Outdoor Leadership Development program at Camp St. Croix. ”Time spent in nature is so valuable and it’s deeply rewarding to see so many more kids attending camp, who wouldn’t otherwise have been able to without the financial support made possible by this music festival,” said Jillian Nodland, Camp St. Croix community board member and co-chair of the Prairie Burn Music Festival. When: Saturday, September 15, 2018 from 12:00 p.m. – 10:30 p.m.
Tickets: Tickets available online at ymcamn.org/prairieburn. Adult tickets are only $35 and $5.00 per child. 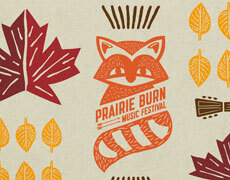 Individuals can attend the Prairie Burn Music Festival for free when they volunteer at the event. More details are available at ymcamn.org/prairieburn or on Facebook. Camping: Camping is $40 and includes a breakfast hosted by Eat For Equity. Visit the website for full camping details. The Royal Credit Union Foundation (Foundation) was established in 2013 to create a positive impact in the communities Royal Credit Union serves. The Foundation exists to improve the lives of Royal’s Members and their neighbors by funding impactful and lasting projects. The Foundation supports organizations located in Wisconsin and Minnesota. Currently, it has awarded over $2.3 million in grants.